Written by Thom Rainer on November 5, 2018 . Posted in Blog, Getting a Job? Churches want and need more help than preaching in an interim period. Depending on how you define revitalization, somewhere between 65% and 90% of all North American congregations need some type of revitalization efforts and strategy. More churches want and expect that of their interim pastors. Churches want to know if an interim pastor has specific qualifications for the job. Related to the first reason, this new reality is growing. More and more churches want to know if the prospective interim is truly trained and qualified for the role. That is one of the major reasons we created Interim Pastor University: to train and provide high-level certification for this unique ministry. Interim periods are growing in length. There are a number of reasons for this phenomenon we have addressed elsewhere. But we know the time between pastors is growing. Churches, therefore, want more than the traditional pastor during this period. Churches need interim pastors to make tough decisions. Many churches now look for interim pastors who can lead to major changes and clean the slate for the next pastor. This type of leadership requires both experience and specific training. The role of the interim pastor is becoming a retirement vocation for many Boomer church leaders. A number of these leaders may do 20 or more interim pastorates as a retirement ministry. Boomer church leaders will not fade gently into the sunset. This reality is a new phenomenon that is changing the way people look at interim pastors. Church life, in general, is more complex. The consequence is the need for an interim pastor who can adjust to these complexities. That interim pastor is different than those of the recent past. As church practices change and church challenges grow, the role of the interim pastor will grow with it. If you are interested in receiving additional training and certification as an interim pastor, join as at Interim Pastor University during our open enrollment period. Keep your eye on these dynamics. The interim pastor of 2019 and beyond will look dramatically different than the interim pastor of 2015. Read the full article Six Reasons the Role of Interim Pastor Is Changing Dramatically that appeared first on ThomRainer.com. Used by permission. Written by Thom Rainer on October 31, 2018 . Posted in Blog, Getting a Job? Pastors’ spouses often receive undue criticism that leads pastors to want to leave a church. Pastor search committees need to be transparent and truthful. “We are ready for change” is often not true. Read the full article Five Ways a Congregation Can Prevent Short Term Pastoral Tenure that appeared first on ThomRainer.com. Used by permission. Written by Thom Rainer on October 29, 2018 . Posted in Blog, Getting a Job? In my post last week, I looked at the reasons pastors were fired, even though their churches were growing. In this post, I offer ways some pastors have avoided this tragedy while leading a church to growth. To be clear, these actions are not foolproof. Some churches will be preacher eaters regardless of the actions of the pastor. Still, I see these right actions as helpful toward minimizing the possibility of a forced termination. Communicate exponentially. If you think you are communicating redundantly, you probably have just begun to communicate sufficiently. Keep the congregation informed. Say it. Write it. Repeat it. Remind the members of the purpose of the growth. It’s about the Great Commission. It’s about caring for and reaching the community. It’s about touching lives. It’s not about the numbers. Move potential objectors to the welcome team. They will see and greet the guests. It will give them an outward focus. Ask a long-term member to be your mentor. You will get an invaluable perspective from “the old guard.” You will likely gain an ally as well. Share healthy resources with members. At the risk of sounding self-serving, I’ve heard from countless church members that two of my books have been paradigm-altering: I Am a Church Member and Autopsy of a Deceased Church. Celebrate the past. Sometimes we leaders need to be reminded that our church’s past has much to celebrate. We often are so eager to move to the future that we forget or neglect the lessons of the past. Remind them of faith steps in the past. Though this point has similarities to the previous point, this one is a specific focus and reminder of major faith steps the church has made in the past. It a powerful lesson that the church made changes in the past and can do it again in the present. For sure, there are no guarantees. But we have heard from many change leaders who have found these approaches to be highly effective. Leading change is difficult. Leading change wisely is best. Read the full article How to Avoid Being Fired When Leading a Growing Church that appeared first on ThomRainer.com. Used by permission. Written by Thom Rainer on October 24, 2018 . Posted in Blog, Getting a Job? Sadly, pastors can get fired when they lead their churches to growth and revitalization. In my post next Monday, I will share some ways other pastors have addressed these dangers successfully in their churches. Read the full article Seven Reasons Pastors Get Fired When a Church Is Growing that appeared first on ThomRainer.com. Used by permission. Written by Eric Geiger on October 23, 2018 . Posted in Blog, Getting a Job? A common struggle leaders face is the conflict between wanting to raise expectations that will cost people on the team time and energy while simultaneously hearing from the team that “they are already maxed out” or “they are at capacity.” It is possible that “being at capacity” is an excuse, and it is possible that the team is really maxed out. So what should a leader do? If the capacity statement is reality, these three capacity cures will help the team create more time and energy. If the capacity statement is merely an excuse, these will help expose that. So either way, the following are wise moves for leaders to take. Leaders are responsible for the development of the teams they lead. If a leader’s team is 5% better than they were a year ago, then the team has 5% more capacity. If a leader of a team keeps declaring that their team is at capacity, and if the workload is really the same as it has been, then that leader has admitted that the team has not been developed. And that is on the leader. Clarity. Discipline. Development. Those are three strong capacity cures that leaders have at their disposal. If you utilize them you will help your team create more capacity OR you will expose the excuse that “capacity” has become. Read the full article What Should a Leader Do When the Team Is “at Capacity”? that appeared first on EricGeiger.com. Used by permission. Written by Thom Rainer on October 17, 2018 . Posted in Blog, Getting a Job? There is no reason why it should take as long as it normally does to fill pastoral vacancies. You should always run legal, social media, and credit background checks on potential pastors before hiring them. Pastors, your social media footprint will follow you throughout life. Don’t do stupid. You don’t have to give all the details of a pastor search to a church, but the congregation needs ongoing updates. Read the full article Six Mistakes Many Search Committees Are Making Today that appeared first on ThomRainer.com. Used by permission. Leading the church in evangelism/reaching the community. Many pastors felt as if evangelism and healthy growth are neglected topics. They admitted their own sense of inadequacy in leading their churches to reach more people with the gospel. Leadership development. Pastors know they can’t do the work of ministry alone. But many of them shared poignantly how they wish they could become better at developing leaders in the church. They understand both biblically and intuitively that more leaders are imperative for a church to be healthy. Finances/business issues/administration. “I never considered how much of church life is running an organization,” one pastor shared with us. “I was never trained for that aspect of ministry, and it has come back to haunt me again and again.” Another pastor confessed that he had never learned to balance his checkbook, but he was expected to lead a church with a half-million-dollar budget. Leading staff. We heard it again and again: “I have no idea how to lead my staff. I have no idea how to evaluate my staff. I have no idea how to deal with conflict among my staff.” In fact, one pastor told me he joined Church Answers for one reason: so he could ask questions about dealing with staff. Counseling. Many pastors shared how much their congregations demand in counseling. They also said the demand seems to grow every year. They not only lack the training to know how to counsel, they often don’t know when to refer people to professionals. Dealing with change and conflict. It is a common theme among pastors. They were told to expect conflict before they became pastors, but the reality was consistently worse than the warnings. They long to know how to lead change and deal with conflict better, but they often feel inadequate in those areas. Dealing with their own depression. A number of pastors admitted surprise when depression hit them. They simply did not expect it to happen to them. Many also admitted shame and embarrassment in talking to others about their struggles. Some even shared confidentially with me their own thoughts of suicide in the past. Equipping others. This particular need is similar to number two, leadership development. But in this case, pastors desire to equip the entire body of Christ, not just leaders. But many pastors feel woefully inadequate in doing so. Read the full article Eight Areas Where Pastors Wish They Were Better Equipped that appeared first on ThomRainer.com. Used by permission. Written by Thom Rainer on October 10, 2018 . Posted in Blog, Getting a Job? You have to have a high level of relational intelligence to connect with church members of all ages. You must be a continuous learner if you want to be a better leader. How you deal with critics will test your leadership mettle. Many ministers fail in ministry because they fail with their families. Read the full article Eight Areas Where Many Ministers Are Unprepared for Ministry that appeared first on ThomRainer.com. Used by permission. 1. Many leaders talk longer than they realize. Many leaders talk longer than they think they do. They can easily dominate meetings because of their convictions, their ideas, and the sheer amount of work to report. But by over-talking in meetings, leaders can unintentionally stifle the team. One practical way to combat the temptation to talk too much is to set a time for yourself and hold yourself accountable not to cross it. 2. Many leaders sound harsher than they mean. Because leaders can underestimate the power of their position, they can sound harsher than they realize. Every word from the mouth of a leader is received with amplified impact, so leaders who bring sharp critiques to their teams must do so very carefully. If the leader thinks the rebuke is a “5,” the people likely hear it as an “8.” Wise leaders steward their words very carefully. 3. Many leaders change direction more than they know. Leaders are often about new ideas, change, and vision. Because of that, leaders can err by constantly bringing new direction to the team. The team can sometimes feel as if they have yet to execute properly the last batch of ideas or see the fruit of the last direction before a leader brings a new direction. Effective leaders know that consistent direction over time is far better than constantly shifting the direction of the team. Of course, there are other common blind spots, but these three can easily hamper a leader’s effectiveness. Blind spots can’t be corrected if the leader doesn’t know they exist. For blind spots to be corrected in a leader’s life, the leader must be in community and humbly listen to others whom the leader trusts. Read the full article 3 Common Blind Spots in Leaders that appeared first on EricGeiger.com. Used by permission. Creating a church’s distinct culture is one of the most important but difficult aspects of leadership. Culture really comes down to shared behavior or values. 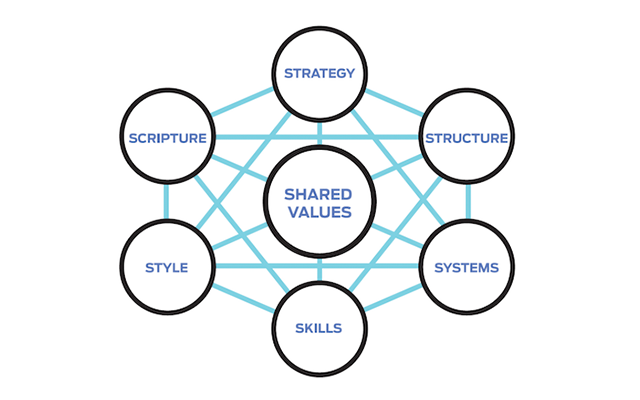 We embed these shared values through Scripture, strategy, structure, systems, skills, and style. * Each component correlates with our leadership pipeline framework. Leadership pipeline does not focus solely on top levels of leadership. Leadership pipeline is a long-term investment in a church’s most valuable resource: people. It provides a clear process of development for every volunteer, leader, coach, ministry director, or senior leader in your church. When these components are implemented, you create a culture that reproduces leaders at every level of your leadership pipeline. Creating a culture for development begins with Scripture. Ephesians 4 clearly states the role of church leaders is to be equippers. Our job is to develop others. But consider passages like Matthew 28 that remind all believers to make disciples, who make disciples, who make disciples. Development is everyone’s responsibility, regardless of leadership level. After establishing a conviction for development, you move into strategy. What’s your development process? Often what we call “training” is instructions to get someone started in a new role. We must shift to ongoing development that helps each person learn the role, then lead out, then multiply themselves in that role. You then know they’re ready for the next level of your leadership pipeline. If a person doesn’t want to advance, celebrate how they invest in and equip new leaders in their ministry role. The next two phases are often difficult to implement: structure and systems. Your church may have a nice structure on paper, but in reality, your church operates in ministry silos. When we lack clarity and alignment, we create confusion for our people. The same is true for systems. Over time, churches drift toward complexity, not simplicity. We add new processes without evaluating or restructuring our current ones. Establishing a leadership pipeline creates clarity and alignment in your church’s language, leadership levels, and processes so your people understand where they are, their responsibilities, and their next step of development. So how do you develop people? Through skills and style of training. You must identify core competencies required for every leadership level of your pipeline. For example, a small group leader and a parking team leader should be equipped in conflict management. Core competencies are universal, but skills also include role-specific skills unique to each ministry area. Style is how you train and develop your people. We encourage flipping the classroom. In traditional training, people gather to learn from a church leader who is a “sage on stage.” In the flipped classroom, people watch training on a topic prior to the gathering time. Training is appropriate to each person’s level of competence, not the same for all. When the group gathers, they discuss their training, and the “sage on stage” becomes a “guide on the side,” allowing the group to process and grow together. Recall again Paul’s command in Ephesians 4 to “equip the saints for the work of ministry.” If we want to get serious about creating a culture of leadership development, we must do so through Scripture, strategy, structure, systems, skills, and style. Our legacy is not about what we do as leaders but those we develop. Let’s build an army to do just that. *Adapted from Thomas Peters and Robert Waterman, In Search of Excellence (New York: HarperCollins, 2006), 9-10. Read the full article The Shared Values of Leadership Development by Todd Adkins that appeared first on EricGeiger.com. Used by permission.